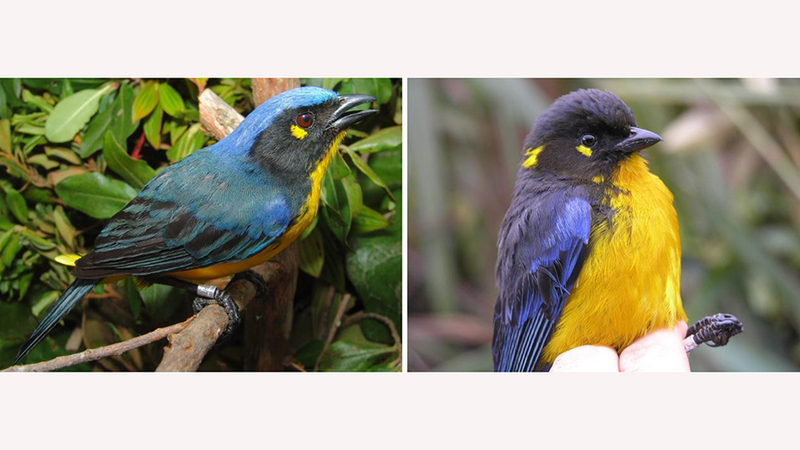 Two different kinds of Lachrymose Mountain-Tanager (Anisognathus lacrymosus) occurring in Colombia on different mountain ranges (left: Santa Marta; right: Yariguies). Their measurements and songs were as distinct as those in the group which co-occur. Therefore, they can therefore be treated as different species. British bird expert Thomas Donegan has dedicated much of his life to studying birds in South America, primarily Colombia. To address this age-long issue of “what is a species?”, he applied a variety of statistical tests, based on data derived from bird specimens and sound recordings, to measure differences across over 3000 pairwise comparisons of different variables between populations. Two different kinds of Three-striped Warblers (Basileuterus tristriatus) occurring in South America (left: East Andes of Colombia; right: a recently discovered population from the San Lucas mountains of Colombia). Note the differences in plumage coloration. While somewhat differing in voice, plumage and some measurements, the couple did not diverge as much as other related warblers that actually co-occur did. These are about as close as subspecies occurring on different mountain ranges could be. However, they marginally failed the proposed new benchmark for species rank. Donegan’s proposals were first presented orally at a joint meeting for members of the Neotropical Bird Club, British Ornithologists’ Club and Natural History Museum in London.